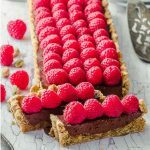 Rich creamy vegan chocolate ganache, fresh raspberries and pistachio almond crust. The perfect chocolate tart! Vegan and gluten free.